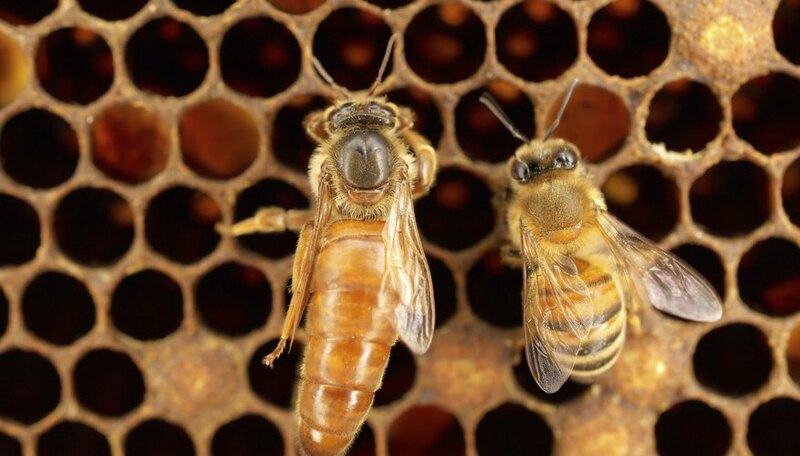 As the only female bee who lays eggs, the queen bee plays a crucial role within her hive. It’s not surprising, therefore, that when a queen bee dies, the entire colony, often numbering up to 100,000, is in temporary disarray. The queen bee releases chemical signals that stop other female worker bees' ovaries from functioning. But shortly after she dies, these chemical signals wear off, which means worker bees can lay eggs, and the highly efficient, tightly controlled system breaks down. The death of a queen bee can create short-term chaos in a colony, but bees know what to do and soon focus on rearing a new queen bee. The most important job of the queen bee, who lives for about five years, is to lay eggs. She can lay up to 1,500 eggs a day, placing one egg in every cell if she is working productively. While the queen bee is pivotal to everything that happens inside the hive, she is not, contrary to popular belief, in control of the colony. In fact, the thousands of worker bees control the queen. They have the power to kill a queen bee and raise a new one, whenever they wish. Some beekeepers replace the queen bee every year to keep the colony strong. The most common causes of the sudden death of a queen bee are disease, predator attack or beekeeper error. When a queen bee dies suddenly the colony is upset but acts quickly to rear a new one. Usually, the workers find eggs or larvae less than three days old and house them in specially constructed, vertically-hanging "queen cells." The fertilized eggs take about three days to hatch. They feed the larvae royal jelly. They pupate in the cells after about six days of rapid growth. About eight days later, the new queen bees emerge, take nuptial flights, mate in the air with the drones or male bees and try to kill other virgin queens. The last remaining queen bee then begins to lay eggs. The process from queen loss to egg stage takes about 29 days. 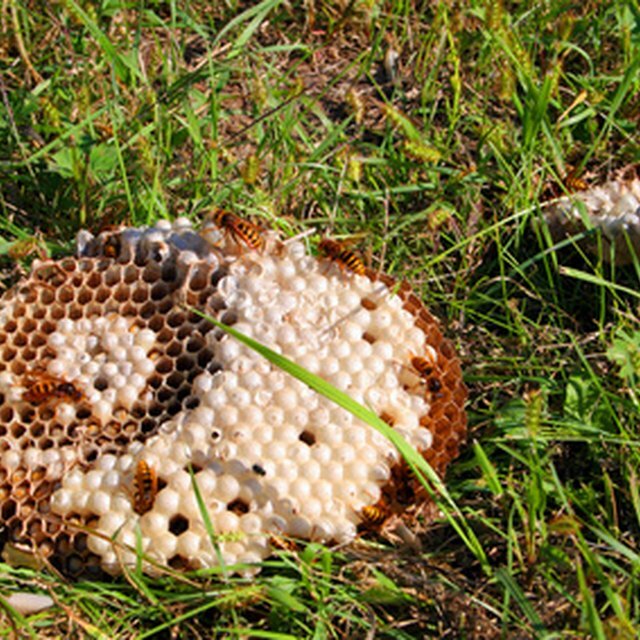 Swarming is common after the loss of a queen bee, or if an aging queen bee's egg-laying abilities are deteriorating. Some of the worker bees leave the colony with a new virgin queen and reproduce the colony elsewhere. To prepare for swarming, worker bees build large numbers of queen cells along the bottom of the comb. Shortly before a new queen emerges, the bees stop their fieldwork. The swarm bees, usually at least half the bees in the colony, guzzle honey, then leave with the virgin queen, fly a short distance and gather on a bush or tree limb. Meanwhile, scout bees look for a good place to create a hive. The bees fly to the new location as soon as it is determined. After the first swarm leaves the old hive, new queens may lead other swarms from the hive within a few days of each other. Usually enough bees stay in the original hive to keep it operating although the colony may be much weaker. The worst-case scenario after a queen bee dies is that the worker bees do not succeed in raising a new queen. A queenless colony cannot survive for a sustained period. The absence of a queen bee affects the behavior of worker bees, making them agitated or aggressive. Worker bees may lay eggs, but because they are not fertilized they are all drones. Since drones do not collect any food or do any work, the number of productive bees drops until the colony disappears. The whole colony may become stressed and vulnerable to pests or diseases. The only way for a beekeeper to save a queenless colony is to introduce a new queen from outside the hive. Gillespie, Claire. "What Happens when a Queen Bee Dies?" Sciencing, https://sciencing.com/happens-queen-bee-dies-5159216.html. 05 April 2018.